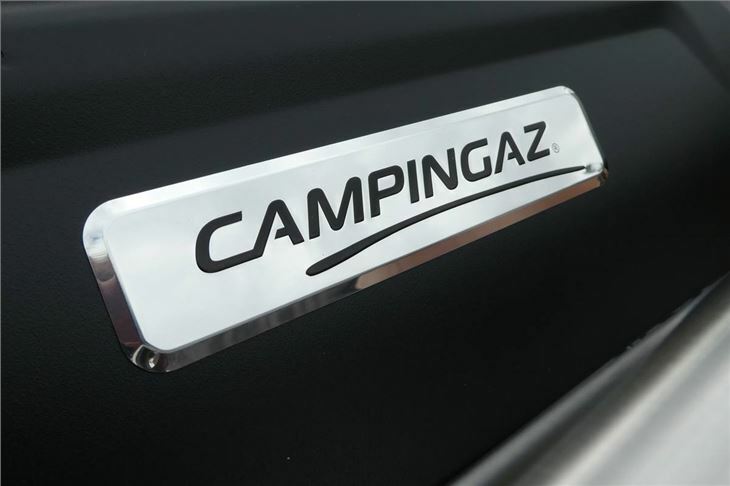 The Campingaz Master 4 Series Classic LXS Black Edition is a high-end, gas-powered BBQ grille with a large cooking area capable of catering for between 12 and 16 guests. 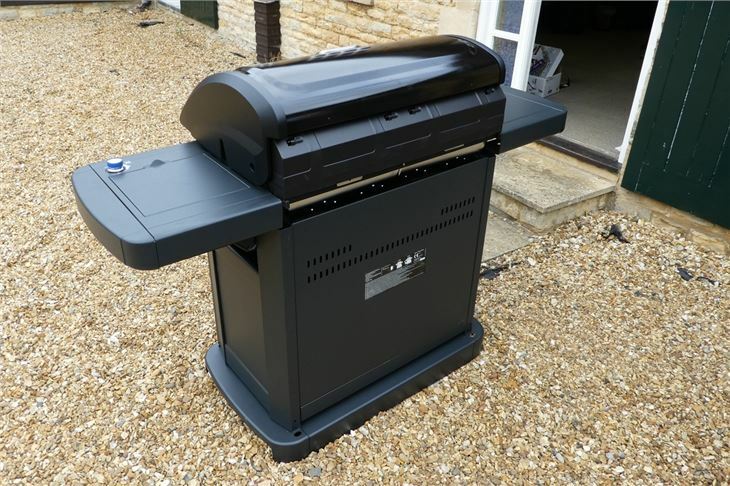 Its long name is fitting - this is a big BBQ in every sense. But at £750, it isn't cheap. So, is it worth the money? The LXS isn't available on Amazon, but the 4 series Classic LS we've linked to is similar. You can compare the two BBQs here. 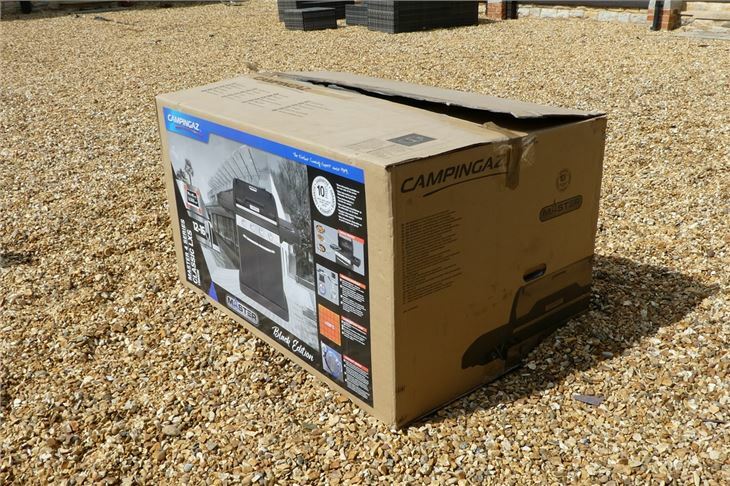 The first thing that you need to know about the Campingaz Master 4 Series Classic LXS Black Edition is that it arrives on a pallet. Yes, a pallet. It’s a huge box and you’ll need to have somewhere set aside to store it if you don’t plan to build it immediately. Plus, someone on-hand to help you move it — it’s very heavy. 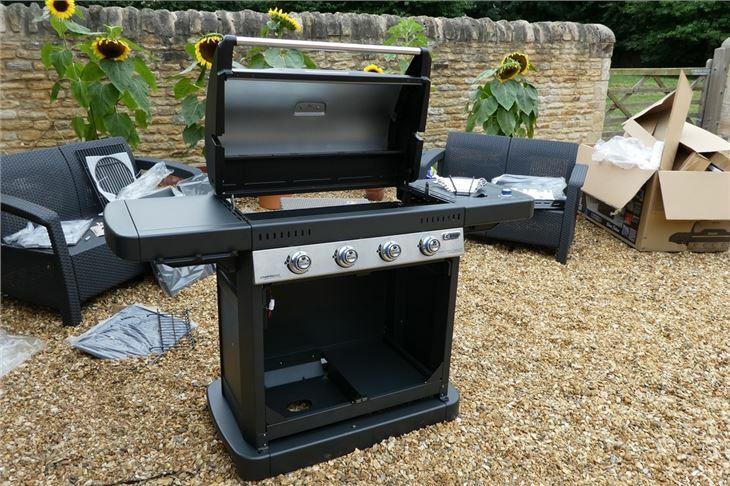 As with almost all BBQs of this size, there’s a fair amount of assembly required. Our build — with two people — took about an hour and a half from opening the box to firing it up. 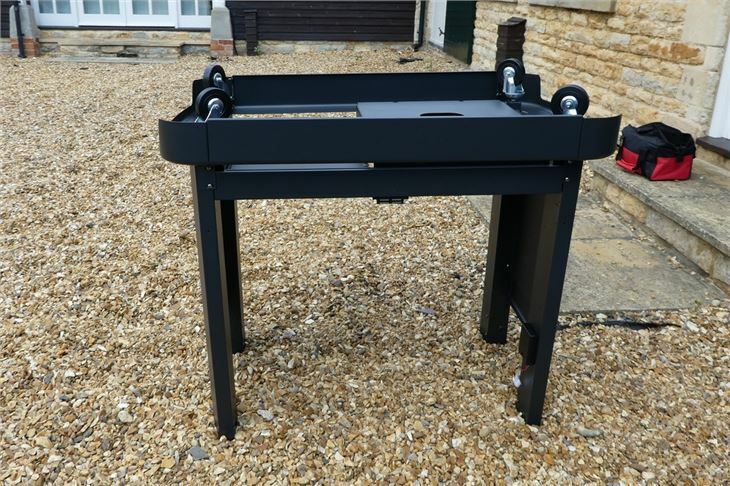 Although a little time consuming, the build is fairly simple with well-explained instructions and only simple tools, such as a screwdriver and spanner, required. It’s built from the floor up and, although at the start it may feel daunting, it quickly comes together. As you’re building, you do get a chance to inspect all the materials that have been used in a way that you wouldn’t if it had been pre-assembled. And here it’s good news, with strong metal parts and precisely-drilled holes confirming that this is a premium product. 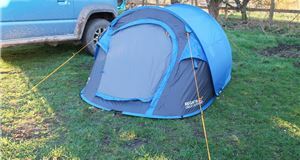 Once built it’s strong, stable and can be easily moved thanks to some sturdy hidden castor wheels. It looks good too, in all black (hence the Black Series name), and stands out on the patio. 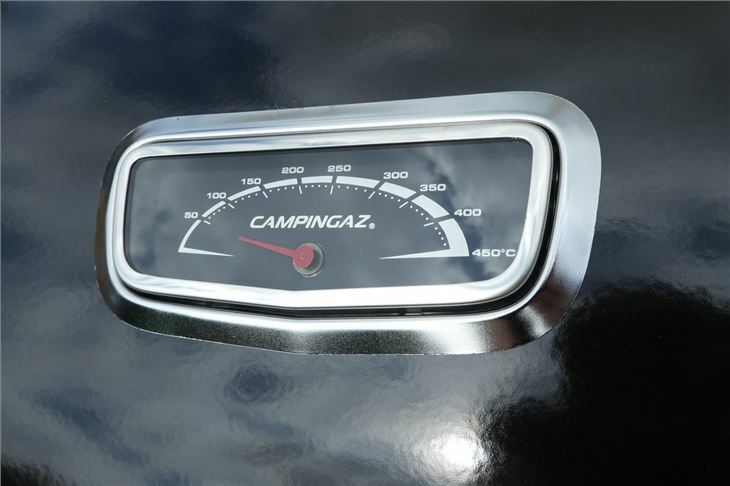 The double-wall stainless steel lid is striking and features a large, integrated thermometer. The two large doors conceal a cupboard that contains the gas bottles and is an ideal space to store a cover when it’s not in use. So, now you’re ready to fire it up. 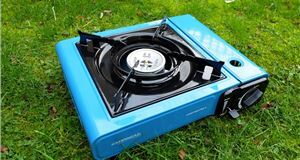 To avoid disappointment, you need to buy a hose and regulator for the gas bottle, as it doesn’t come with a hose and regulator to connect to a gas bottle, so you’ll need to order one separately to get up-and-running (they generally cost £10-£15 and are available from Amazon). 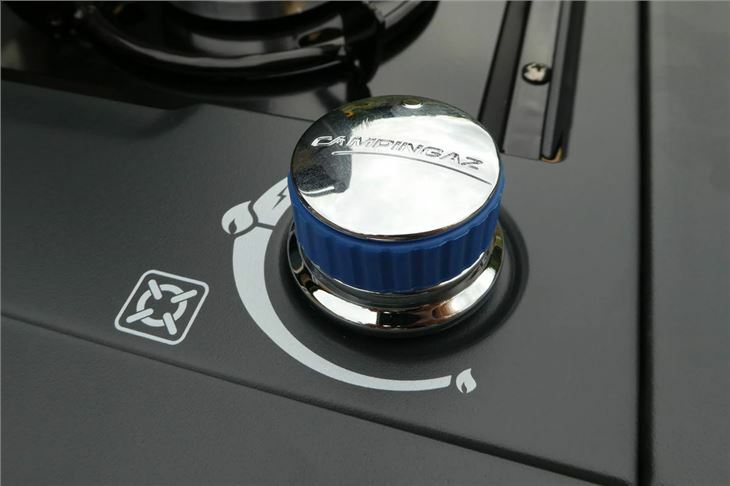 Once connected, ignition is easy with Campingaz’s Instastart electronic ignition system. 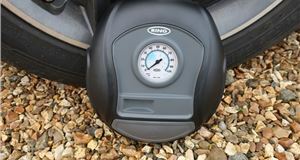 The electric ignition is powered from AA batteries and simply ignites with a push and a turn of the buttons. 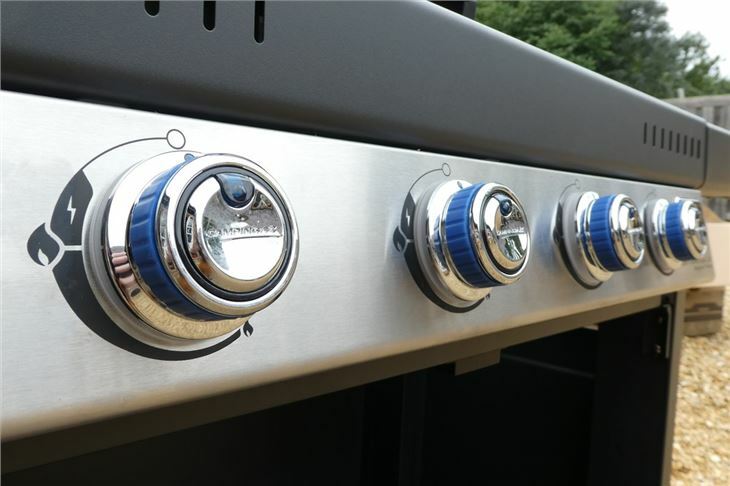 The control knobs are backlit in blue, which not only gives a smart look but makes it more practical to use in the evening. 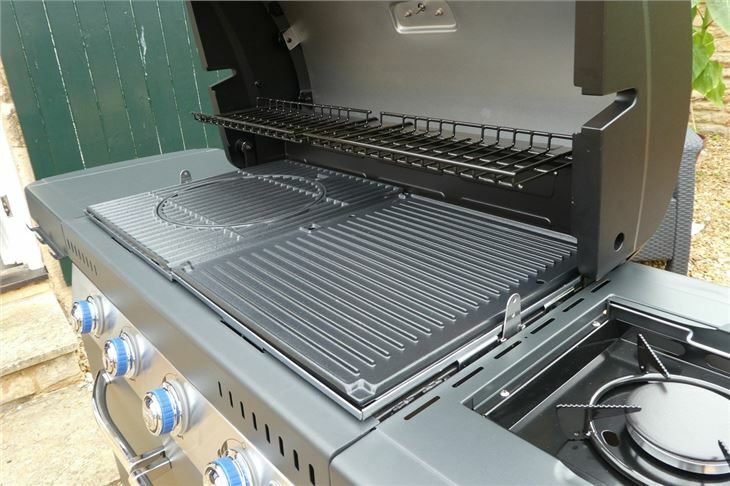 The two primary cooking surfaces are a grill and a plancha grill, heated by four stainless steel burners between them. 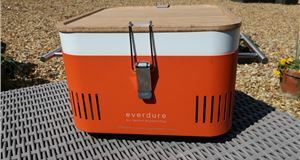 Both surfaces heat up quickly — especially with the lid closed — and provide a huge cooking surface. 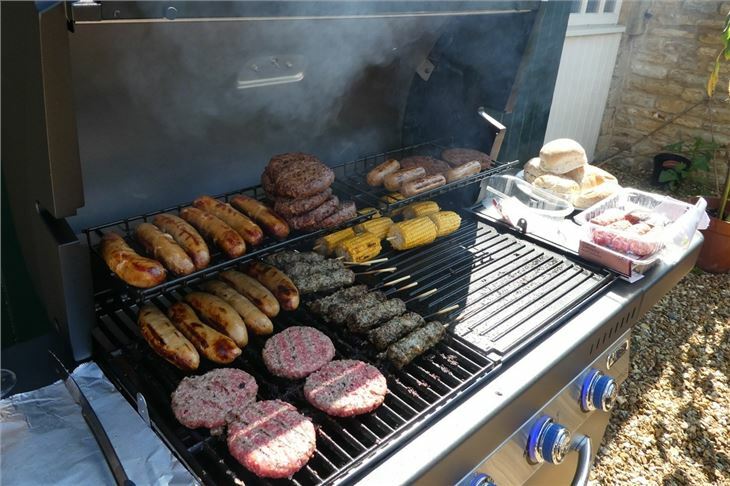 There’s enough room for at least 20 sausages and 10 burgers (and more) to be cooked at the same time. 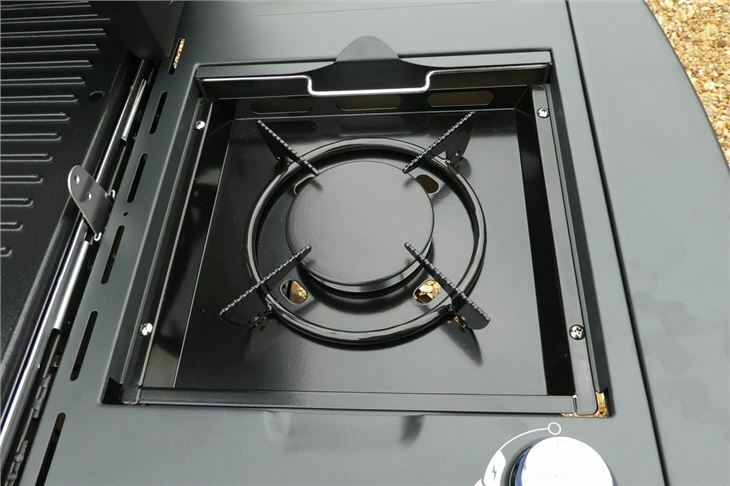 In fact, there’s so much cooking space that the real challenge is keeping on top of everything, though with highly adjustable burners it’s possible to keep some areas of the BBQ much cooler than others for a combination of heat zones. 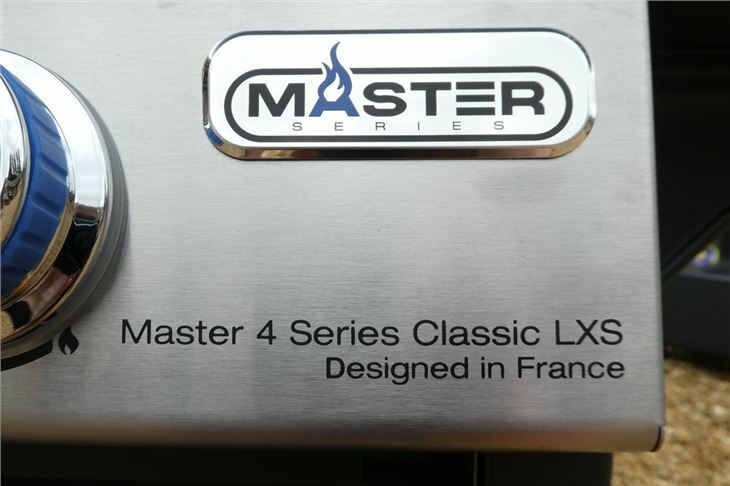 The Master 4 Series comes with the impressive Searing Boost Station (SBS), an extra hit of intense heat, giving those authentic steakhouse stripes and flavour. During our tests, the heat was evenly spread and the food didn’t burn quickly — even when it was full. As with all BBQs, there was some spitting as fat hit the burners, but nothing out of the ordinary. This model also comes with two incredibly sturdy side tables. One is more than big enough for utensils, packages of food etc, while the second has a concealed wok burner for cooking onions and side dishes that require a pan. 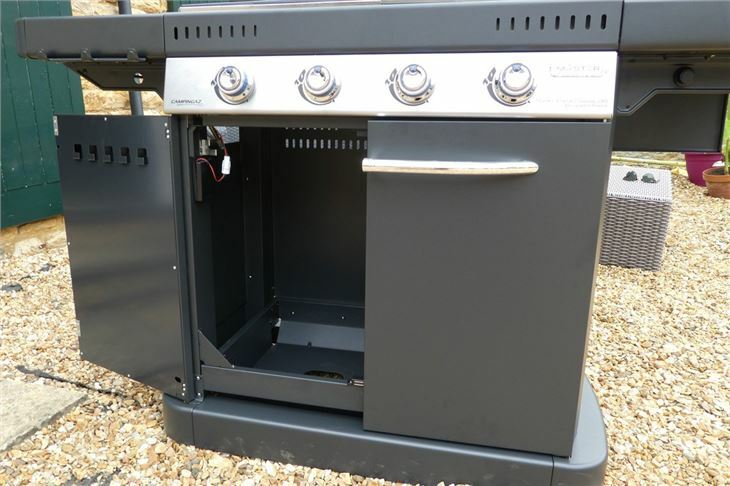 As well as looking good, the stainless steel lid gives this Master Series BBQ oven-like versatility, making it more of an outside oven than just a BBQ. 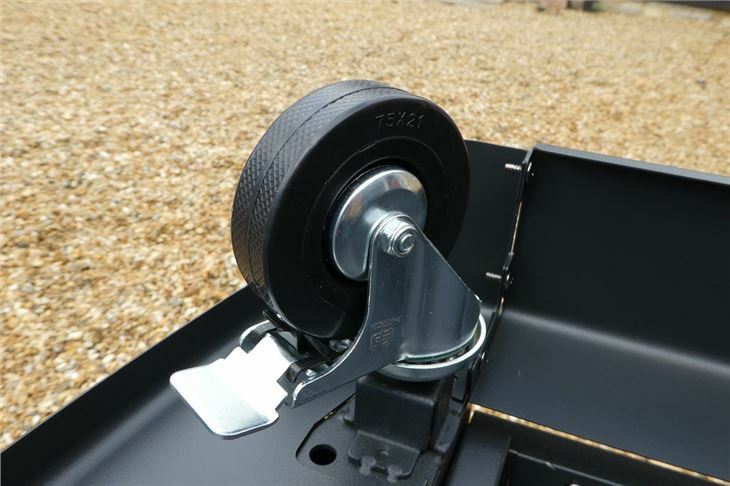 Further optional accessories mean that you can take out the inner cast iron grid on the main grille and replace it with a pizza stone, paella pan or poultry roaster. 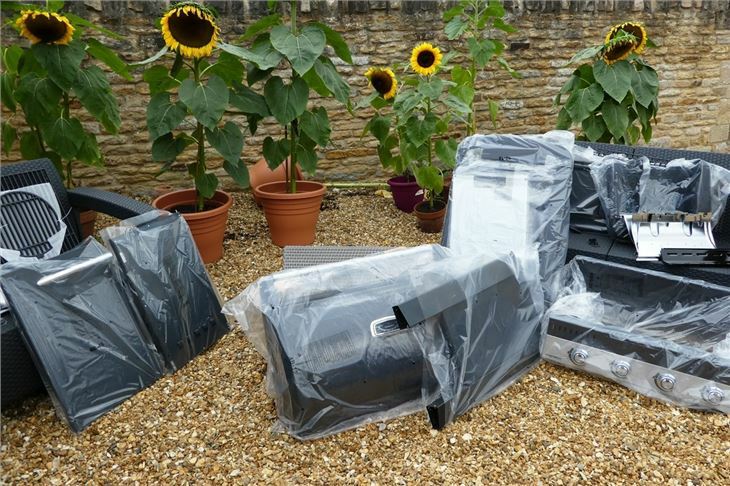 The huge downside to BBQs is cleaning up afterwards. But it’s not an issue here. 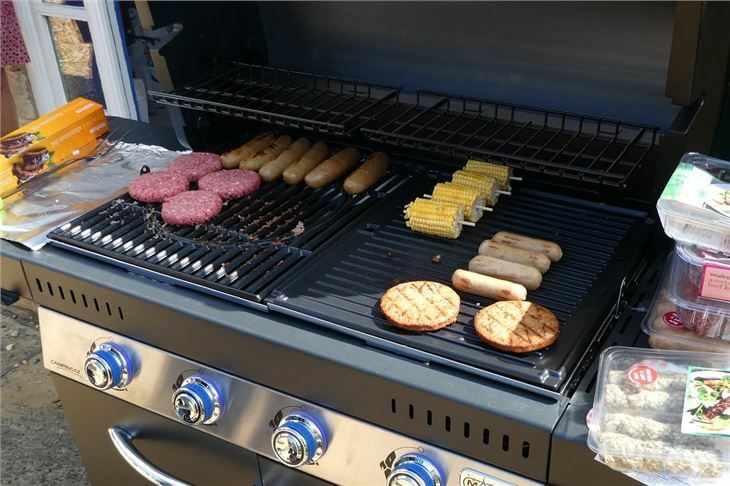 The grilles are coated with a non-stick material, which means less fat sticks to them in the first place. And — as they’re dishwasher safe — we put them in on a hot cycle on their own with a good quality dishwasher tablet and they came out as good as new and entirely grease-free. This is a huge advantage over standard grills. At this price, we would have liked to have seen a regulator and cover included (both are optional), but that doesn’t have an impact on our verdict. 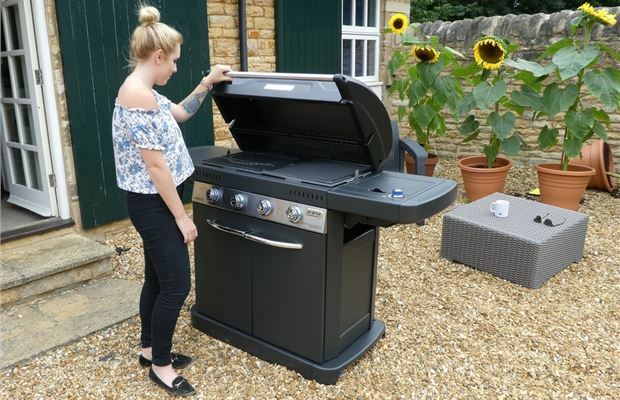 For the serious BBQ chef - or for people who regularly cater for large amounts of people — this is well worth the money. 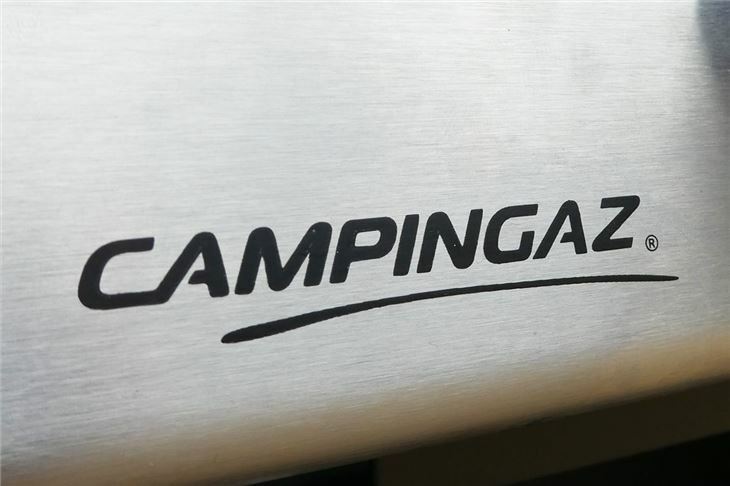 It’s a significant outlay on a BBQ, but the Campingaz Master 4 Series Classic LXS Black is made from high-quality materials with key parts manufactured in rust-resistant stainless steel — which means it should be many years before you’re looking for a replacement.